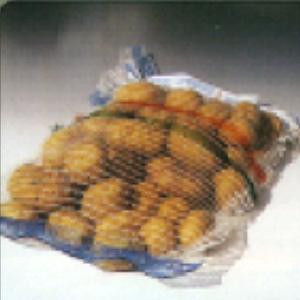 Packaging generally used for potatoes, garlics, onions and chestnuts. The packaging machine must be automatically feeded by an electronic weighing machine. La pesatrice determina quantità e peso del prodotto da inserire in ogni confezione, la confezionatrice verticale realizza la confezione e tramite una cucitrice chiude il sacco. The electronic weighing machine sets amount and weight of product for every sack, the vertical packaging system fills the sack, and a sewing machine sews it. An adhesive or thermic label printer can possibly be installed to put such label directly on sack’s stripe.